Once you've established a successful business, growing that business will typically follow a logical evolution, unless you don't believe in evolution, in which case, you own In N Out. Now give me a burger! 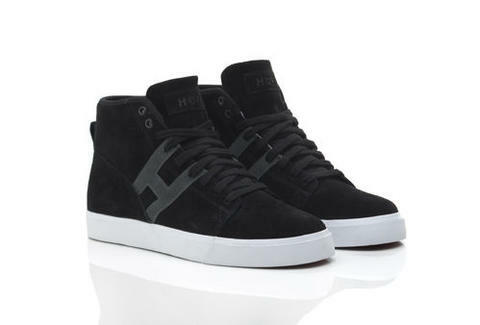 For a company making its logical evolution from streetwear, HUF Footwear. From certifiable skateboarding legend Keith Hufnagel (who's been hooking up dope street- and skate-wear in SF since HUF opened in '02) comes his first-ever in-house, single-branded shoe line just dropped in both high and "low cuts", cuz who doesn't like a little toe cleavage? High-tops include the Hupper (red, black or blue canvas upper, rubber outsole with suede HUF logo detail), an almost identical Hupper Numero Uno edition (featuring a stylized No. 1 on the heel), and the HUF 1, with a suede upper featuring two brand labels that read "Dirtbag Crew," a gum bottom and a vulcanized sole, perfect for long Treks. Low-top options range from the boat-soled Genuine (mid-top silhouetted slip-on in navy or olive with just four total grommets), to the more lace-heavy and skateboarding standard Choice, which comes in black or red with a heel panel made of leather, so needless to say Chris Berman's brusquely demanding it come home and bang him. Adding a twist to the line, HUF's also sporting a new Star Pack, which adds a star-printed midsole to the Genuine, Choice, and Hupper, plus an American flag graphic on the bottom and a gum toe, also the natural evolution as we move from monkeys to our next stage: being made of delicious, melonrageous candy. Now give me a burger!